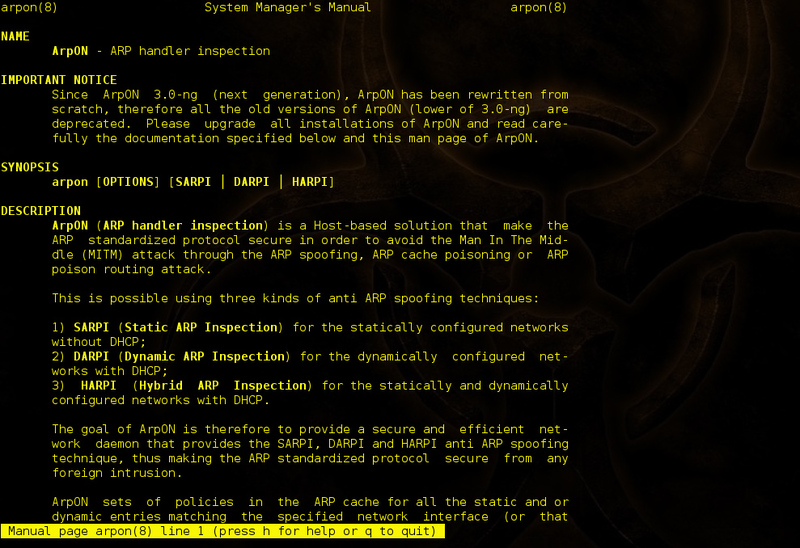 Browse: Home / ArpON “ARP handler inspection” v3.0-ng released. 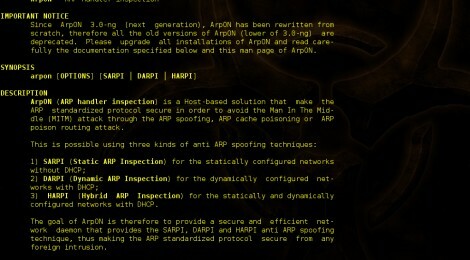 ArpON “ARP handler inspection” v3.0-ng released. Since ArpON 3.0-ng (next generation), ArpON has been rewritten from scratch, therefore all the old versions of ArpON (lower of 3.0-ng) are deprecated. Please upgrade all installations of ArpON and read carefully the documentation and the man page of ArpON. 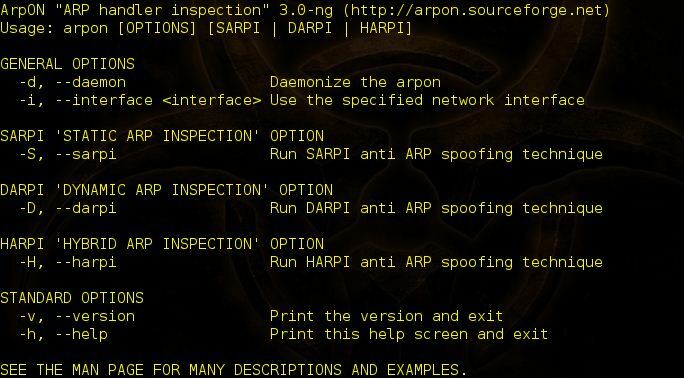 ArpON (ARP handler inspection) is a Host-based solution that make the ARP standardized protocol secure in order to avoid the Man In The Middle (MITM) attack through the ARP spoofing, ARP cache poisoning or ARP poison routing attack. + HARPI (Hybrid ARP Inspection) for the statically and dynamically configured networks with DHCP. The goal of ArpON is therefore to provide a secure and efficient network daemon that provides the SARPI, DARPI and HARPI anti ARP spoofing technique, thus making the ARP standardized protocol secure from any foreign intrusion. + Free. ArpON is released under the BSD open source license. This means that you have total freedom to modify and use it with your system, even if it’s commercial. + Popular. ArpON is used as the network daemon by many users, both the network managers and academic researchers. ArpON is downloaded several hundred of times every month. + Tested and reliable. Many users have contributed over the years in testing ArpON on a wide range of Man In The Middle (MITM) attack tools through the ARP spoofing, ARP cache poisoning or ARP poison routing. + Easy to use. ArpON is distributed as a single tarball that once compiled, runs on every supported Operating System. You launch the executable, and from that moment the Operating System is able to avoid the Man In The Middle (MITM) attack through the ARP spoofing, ARP cache poisoning or ARP poison routing. + Multi-platform. Many developers have contributed over the years in porting ArpON on a wide range of GNU/Linux distributions. + Compatible and portable. ArpON is completely compatible with the ARP standardized protocol. ArpON is an network daemon that runs in user space, this also means that ArpON will be easily portable to other Operating Systems. + Well documented. The documentation of ArpON is easy and complete. The documentation contains the retrieving tutorial; the building tutorial; the installation tutorial; the user tutorial with many examples and scenarios; the development tutorial with the Activity diagrams of the SARPI, DARPI and HARPI anti ARP spoofing technique and with modular source code well commented; the bug report tutorial that takes you step-by-step through all of the features of ArpON. ← Venom.sh Codename: Komodo Venom v1.0.10.